Unsigned NFL quarterback Colin Kaepernick is preparing to file a grievance against NFL owners for collusion and has hired high-profile attorney Mark Geragos, according to reports. Bleacher Report’s Mike Freeman first tweeted news of the grievance Sunday afternoon, adding that Kaepernick will be releasing a statement. During the 2016 NFL season, Kaepernick was the first NFL player to kneel during the national anthem as a protest against racial injustice and police brutality in America. When that didn’t happen, and far less talented quarterbacks were signed to start or even serve as backups this season, many believed that the NFL owners had blackballed the 29-year-old for his actions. 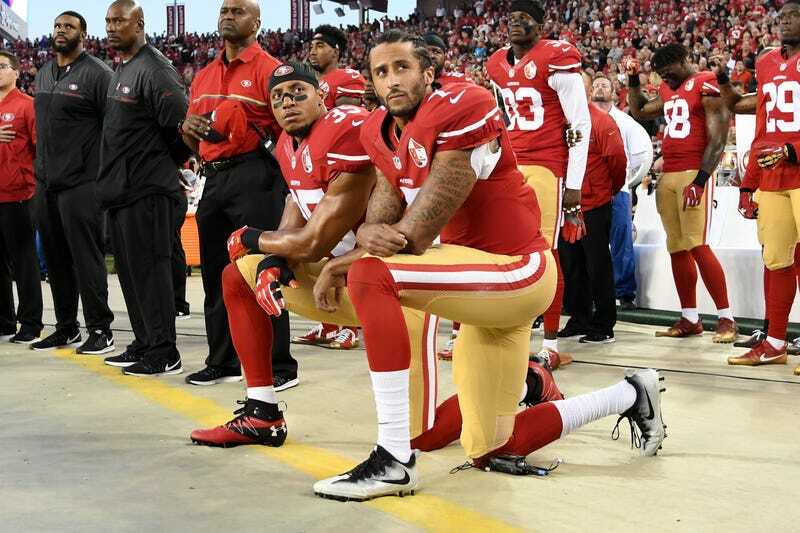 Several NFL players have continued to kneel this season—not only in support of Kaepernick but also to continue to bring light to the reason he began his protest in the first place: racial injustice in America, much to the dismay of some fans and President Donald Trump, who has repeatedly spoken out about the players’ actions. Others, however, including Howard University’s cheerleaders, a German soccer team and the cast of Miss Saigon, have all knelt in solidarity with him. Read more at Bleacher Report and Sports Illustrated.